Here in New England lobsters are usually steamed with some rockweed (seaweed); clams and oysters are served raw on the half-shell with just a spritz of lemon and a dash of hot sauce; and scallops are pan-seared until barely translucent. But these ingredients also make for great grilling especially when you add a touch of chile peppers. Shrimp are sold by size, the number of shrimp that make a pound. They are sold as U/8, U/12, 16/20, 21/25 and such with the “U’ meaning under the number per pound. Adding confusion to the size is the variety of descriptions used for shrimp: Colossal (U-12), Jumbo (21/25), Large (31/35), Medium (41/50) and Small (51/60). For grilling I like to use jumbo or large shrimp. For this recipe, thin strips of jalapeño chiles are inserted into the shrimp and the shrimp are marinated in a zesty marinade to add a little sweet heat. After marinating, the shrimp are wrapped in prosciutto (you could use bacon) and grilled. Seed the jalapeños and finely slice one of the chiles into eight long pieces. Make a narrow slit in the back of each shrimp (where the vein used to be) and stuff the shrimp with one jalapeño slice. Finely dice the remaining jalapeño. Combine the diced jalapeño, olive oil, chili sauce, minced green onions, lemon juice, garlic, salt, cayenne and black pepper in a medium mixing bowl. Allow the flavors to blend for one hour. Add the shrimp. Marinate, refrigerated and covered, for at least 15 minutes. 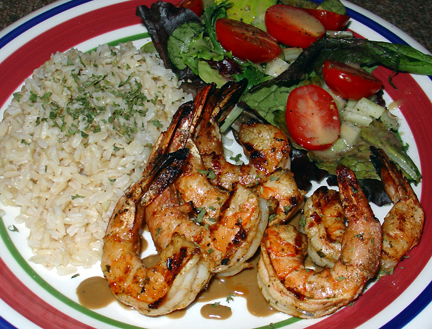 Remove the shrimp from the marinade, reserving marinade. Reheat the marinade in a small saucepan and simmer for five minutes. Preheat the grill for medium-high heat direct cooking. Wrap each stuffed shrimp with prosciutto and place the shrimp on the cooking grate. Cook for two to three minutes per side or until the shrimp are barely opaque. Brush with the reheated marinade during cooking. The Eastern or Atlantic oyster, which accounts for about 85 percent of the total United States oyster production, is found from Florida to Cape Cod. Because oysters feed on the water where they grow, the salt and other nutrients in the water, pollution levels and seasonal temperature changes affect their flavor. On Cape Cod, Wellfleet oysters are metallic, salty, crisp and sweet; Chilmark (Martha’s Vineyard) oysters have a higher salt taste, extremely plump, mild and smooth. Blue Points, most commonly served at raw bars, have a mild flavor, a bit salty and plump. On the left coast, Kumamoto is the most common oyster with plump meat, a buttery texture and a sweet melon-like flavor. 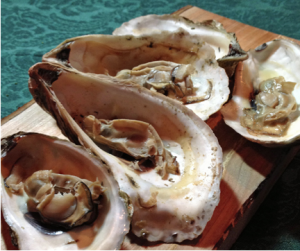 How an oyster tastes is described in many ways: briny, sweet, salty, buttery, even slightly coppery or metallic. Much like a fine wine or cheese, an oyster’s “finish,” the flavor that lingers on your palate, is also used to describe the taste. Recently I received some Standish Shore oysters farm-raised in Duxbury, south of Boston, from Pangea Shellfish Company, a major Boston-based distributor of 70 types of seasonal oysters and shellfish. The company ships nationwide (pangeashellfish.com). (The website is also a wealth of information on shellfish.) 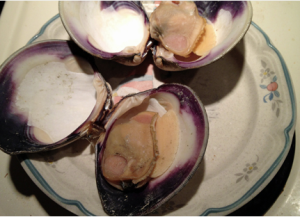 The company also sent me some topneck hard shell clams harvested from the waters of Cape Cod. Combine the vinegar and shallots in a small mixing bowl. Let the mixture rest for 10 minutes. Add the brown sugar, fish sauce and the red pepper. Stir well to dissolve to sugar. Adjust sugar and chile to taste. Prepare the grill for medium-high cooking. Shuck the oysters removing the flat side of the shell. Place the oysters on the grill and cook the oysters until they start to curl around the edges and the liquor begins to bubble. Remove from the grill and spoon the mignonette sauce atop the oysters. Fill a large stock pot 3/4 full with heavily salted water. Add the quartered lemon and bring to a boil. Insert a metal skewer down the lobster tail so the tail remains straight when cooking. Add the lobsters and parboil the lobsters for four minutes. Remove the lobsters and shock in an ice bath. Remove the bands holding the claws and slice the lobster lengthwise all the way through into two halves. Remove the organs from the lobster head and body. Crack the claws with the back of a chef’s knife. Brush the exposed meat with a mixture of melted butter, lemon juice, salt and freshly ground pepper. Prepare the grill for medium heat direct cooking. Lay the lobster flesh side down and cook for about five minutes. Then turn it over, brush on more lemon butter, and cook shell side down for another five minutes. When finished the meat should be firm and opaque, about 135 degrees F. when checked with a thermometer. Serve with lemon butter on the side. 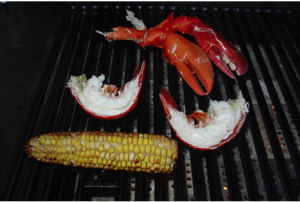 If you don’t want to bother with whole lobsters (or can only get frozen lobster tails), here’s a quick and easy way to grill them. Preheat the grill for medium-high direct heat. In a small bowl blend butter, chives, tarragon, minced garlic, hot sauce, Old Bay and black pepper. Cover with food film and reserve. Butterfly the lobster tails straight down the middle of the softer underside of the shell. Cut the meat down the center without cutting all the way through. Brush the tails with olive oil and season with salt. Grill the tails cut side down over medium high heat for about five minutes or until the shells are bright red in color. Turn the tails over and spoon a generous amount of the compound butter onto the meat. Cook until the meat is opaque and white or to about 135 degrees F.
Compound butter – unsalted butter mixed with herbs and sometimes citrus – is a great thing to have on hand… depending on what herbs are in the butter, compound butter works well for steak, veggies and seafood. The butter is easy to make, simply combine the herbs with softened butter, form it into a log with plastic wrap and store it in the freezer. This compound butter may also be used for vegetables or baked potatoes. It will keep, frozen, for up to six months. In a large bowl, combine the ingredients with a fork. Mash with a fork until smooth; season with salt and white pepper. Form the butter mixture into a log about four inches long and one inch thick. Wrap in waxed paper; and then tightly wrap with food film. Freeze until firm, at least one hour. Thoroughly scrub the clams with a stiff vegetable brush. Shuck the clams discarding the top half of the shell. Prepare the grill for medium-high cooking. Place the clams on the grill and cook until the clams are opaque (about three minutes). Dot with the compound butter and serve with lemon wedges and hot sauce. Unlike clams which are dug from mudflats and oysters that are pried off rocks, scallops are free-swimming and are harvested in trawls, dredges or by divers. 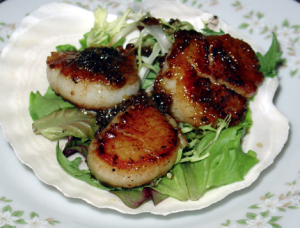 There are three types of scallops commercially available – sea, bay and calico. The sea scallop, the largest of the three, yields from 10 to 40 scallops per pound. They are excellent for grilling. The smaller and sweeter bay scallop yield 50 to 120 per pound. Bay scallops are sometimes eaten raw as ceviche. Many bay scallops are imported from China and Mexico. Bay scallops are best prepared by quick pan-searing. Calico scallops are smaller and less expensive than bay scallop as they are steamed opened and not shucked by hand. They are often substituted for bay scallops but are less tender and less flavorful. Calico scallops are harvested in the Gulf of Mexico, Florida’s east coast and along the northern coast of South America. In this country, only the adductor muscle of the scallop is eaten while in Europe the muscle and crescent-shaped pink/orange roe are consumed. In a small bowl combine the sake and ginger. Place the scallops in a resealable bag and add the marinade. Marinate, refrigerated, for 30 minutes. Combine the brown sugar, ketchup, chicken stock, rice vinegar, soy, cornstarch, garlic and crushed red pepper in a small saucepan. Bring to a low boil and simmer for one minute. Remove the scallops from the marinade and thread the scallops onto skewers. Prepare a grill for medium heat (350 degrees F.) cooking. Grill the scallops for two to three minutes per side or until barely translucent. Brush the scallops with the sauce and serve. Barbecue editor Mike Stines is the author of the critically acclaimed Mastering Barbecue (Ten Speed Press, 2005). He has been conferred a doctorate in barbeque philosophy (Ph.B.) by the Kansas City Barbeque Society and is one of 26 persons in the world to hold the Greasehouse University degree. His website is CapeCodBBQ.com.